It's time for the State Fair of Oklahoma! When you go to the fair make sure you come and see us in our new booth in the Centennial Building. We have changed buildings for the first time in almost 40 years! We love going to the fair and getting to see all kinds of people we don't usually see and introducing them to Bernina. We will have our quilters out there, so if you want to test drive or have a friend test drive a Q24 on a frame or a Q20 in a table, stop on by! 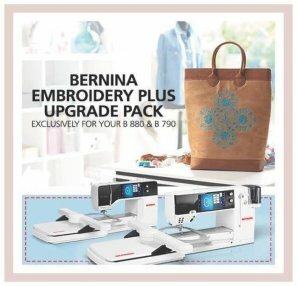 We will also have a variety of Bernina sewing and embroidery machines and a couple of cabinets. This is a big sale this year. We've got close outs of the 5 series and also discounts on used machines as well as State Fair models and more! 880 and 790 Upgrades are in stock and ready to be installed! Make an appointment to have it done while you wait or check your machine in for it's annual tune up and we will take care of it during your service. Pin point placement, thread away, and may more features! It is sale priced, so give us a call at 405-840-8911 to find out the savings! Look for the Fall/Winter Newsletter on Tuesday, Sept 5th!